The US presidential race has drawn attention to the impact that people who only use cellphones may have on polls. Apparently, pollsters are not allowed to call mobile phones (the US uses the receiving party pays system for cellphones). With a growing number of people abandoning fixed lines in favor of wireless phones, this could have an impact on poll results. According to Mediamark Research, Inc., 69% of American homes have a mobile phone. Of those, 63% also have a fixed line while 5.5% of households use only mobile phones. 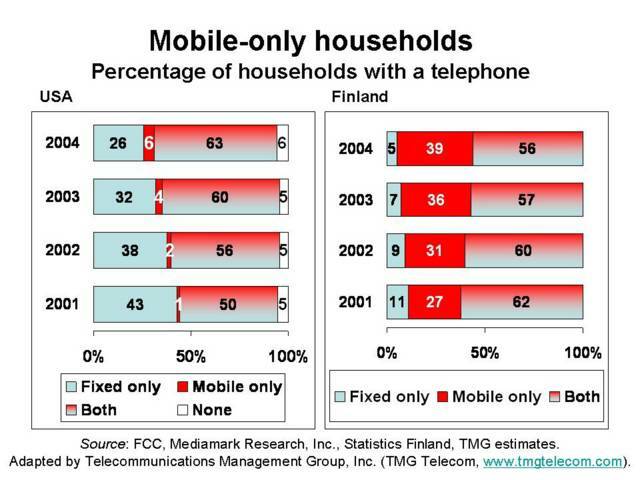 Finland, home to Nokia, the world's top cellphone vendor, has perhaps the highest ratio of wireless-only households. 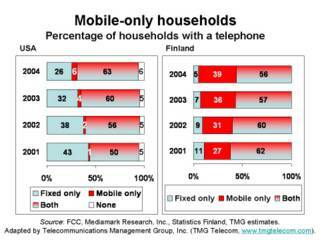 According to Statistics Finland, 39% of households there use only mobile phones. Now that would really throw off the polls.